As never before, the American public is fascinated by how the United States government gathers intelligence. 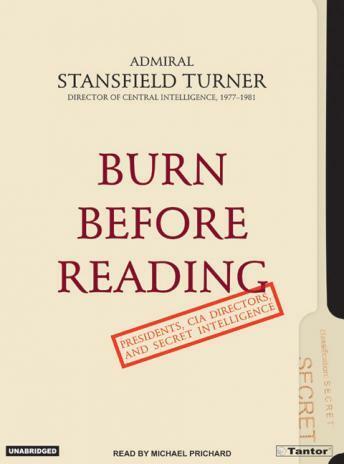 And there is no one better than Admiral Stansfield Turner, CIA Director under President Carter, to reveal the politics and personal issues that can interfere with how the President of the United States deals with the Intelligence Community and the CIA Director in particular. In never before told anecdotes, Admiral Turner takes the reader inside the White House, into closed door meetings and tense discussions, showing the workings of the US government with a kind of understanding that comes from being an intimate of many high-level government officials, including ex-Presidents. Admiral Stansfield Turner served as Director of Central Intelligence from 1977-1981. As such, he headed both the Intelligence Community (composed of all of the foreign intelligence agencies of the United States) and the Central Intelligence Agency. He was responsible for developing new procedures for closer oversight of the Intelligence Community by Congress and the White House, led the Intelligence Community in adapting to a new era of real-time photographic satellites and instituted major management reform at the CIA. Previously as an Admiral in the U.S. Navy he served as commander of the U.s. Second Fleet and NATO Striking Fleet Atlantic, and as the commander-in-chief ofNA TO's Southern Flank. This is his fifth book.